Posted	 March 14, 2017 by	Sikh Dharma Ministry & filed under Bana, Ministry. Celebrating the 350th Anniversary of Guru Gobind Singh’s birth, I reflect on the radiance he embodies. As the Father of the Khalsa, the warrior, Guru and poet, Guru Gobind Singh bowed to the everlasting light embodied in the Siri Guru Granth Sahib. This act forever changed the path of the Sikhs, enabling each of us to hold the Divine Light through our own Radiant Body. Guru Gobind Singh modeled it for us, led us directly to God, and showed us how to live through this radiance. He gave us bana as a way to experience and live this light. Through bana we are reminded that we reflect the light of the Guru. When we put on our bana, we call ourselves up to Simran, living through the vibration of the Shabd Guru. When I put on my bana, I have the opportunity to sink into the sacred vibration that is Ang Sang Wahe Guru—God in every cell of my being. I work with young adults struggling with mental illness and the behavioral problems that come along with it. As a body worker and nascent counselor, it is the vibration of the Guru through my presence that serves my clients the most. When I serve from this place, from my embodied experience of the Shabad Guru, the neutrality of radiance comes forth. It has a power, an Infinite, neutral power, existing beyond the limitations of the ego. It is then that I can embody truth and speak it. Bana is an expression of our radiance. It provides a palpable containment that communicates that we are strong, safe and focused. It communicates our unwavering commitment to our spiritual life. When people see us, they not only see that commitment, but they feel it. They feel the radiance of the Shabd Guru expressed through and contained by our bana. My actions deliver the radiance given to me by the Guru. My bana holds this radiance and extends it outward, calling me to own it, feel it and ground it within myself. I recently had an experience of the power of the Radiant Body. I made a commitment to myself to read from the Siri Guru Granth Sahib for 31 minutes for 1000 days. On New Year’s Eve, I was doing my nightly reading during the Gurdwara, bathed in the sound current emanating from the ragis. At one particular moment, I felt the Shabd Guru penetrate my aura and permeate every cell of my being. Simultaneously, I felt the power of its vibration radiate out from me. It was as if it hit my center core and rebounded outward from it. This experience has remained with me. The vibration of the Shabad Guru envelops me like the pericardium holds the heart. I feel it in my heart, in my aura, in my Arc Line and Radiant Body. I feel it in my skin. When I attune to this vibration, I live through the Shabad Guru. Everything I do reflects this vibration and I see, feel and embody the power of the Shabad Guru. 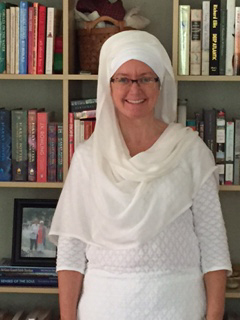 SS DukhNiwaran Kaur Khalsa is an ordained Sikh Dharma Minister. She is a therapeutic body worker serving young adults in a mental health center and she also works as a massage therapist at the Kovler Center for Survivors of Torture and at Mercy Hospital’s Breast Cancer unit, tending to the body and spirit of her clients. She passionately teaches these tools to others, so that they can deepen their own connection to self. At the annual 3HO Summer and Winter Solstice Sadhana, she has the honor of co-managing the Hospitality missal each year and has also served as sevadar in the Amrit Sanchar. 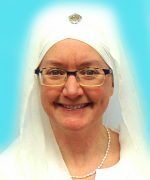 She also is a facilitator with the Journey into the Heart of Sikh Dharma course. DukhNiwaran Kaur lives in Chicago with her wife of 26 years.